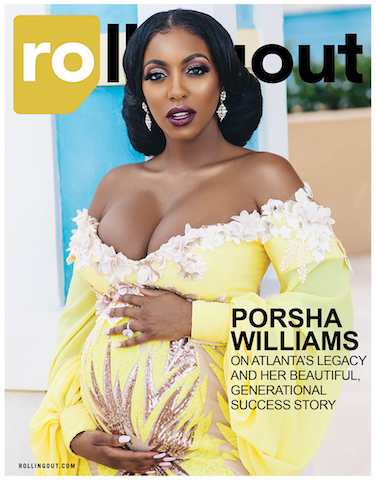 Bahamian fashion maestro Theodore Elyett crescendos again and lands the cover of Rolling Out magazine, outfitting the glowing mom-to-be and Real Housewives of Atlanta star Porsha Williams in a yellow, off-the-shoulder maternity gown. Porsha was photographed this winter during her baby-moon vacation in The Bahamas. The image, captured by Bahamian celebrity photographer Stanley Babb, shows Porsha cradling her baby bump in Elyett’s flattering gown, featuring handmade floral applique along the plunging neckline, sequin inserts on the torso and his signature bishop sleeve with pleated cuff. The material for the gown was donated by Commonwealth Fabrics. The cover image has garnered more than 260,000 Instagram likes on popular social media feed ‘The Shade Room’ and been featured by international publications including the Daily Mail and Bossip. A contingent of Bahamian artists lent their talent to the shoot. Makeup artist Sarsha Lepeche executed a flawless jewel coloured glam on Porsha, and filmmaker Judah Forbes shot the highlight video. “I honestly cannot adequately express how grateful I am for Stanley’s gift and willingness to take Bahamian talent on his journey of success,” continued Elyett. This is the second international magazine cover Elyett and Babb have collaborated on, following their Ellements Magazine cover in 2017 featuring Elyett’s Bahamian Opulence collection that showcased in Beijing. The Rolling Out magazine cover comes on the heels of Elyett’s Commonwealth Fashion Exchange showcase at Buckingham Palace before a royal audience, where he rubbed shoulders with Her Royal Highness Countess of Wessex, Sophie; supermodel Naomi Campbell and Vogue UK’s first Black Editor, Edward Enninful. Elyett is a trailblazer in Caribbean fashion. His fashion portfolio dates back to 1998 when he emerged as a 13-year-old award-winning designer. Since then, he has built a portfolio in the Caribbean, South America, North America, Africa, and Asia. He became a Bahamian ambassador for the arts when he emerged as the fan favourite and the winner of Mission Catwalk Season 3 in 2014. In recent years has showcased his designs at London Fashion Week, the Royal Ascot 2018 and collaborated with international Austrian crystal brand Swarovski.